Most of us are on Facebook every day and pretty much do the same things – look at what our friends have posted, maybe post a new status of our own sometimes. 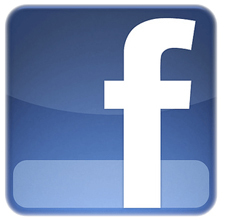 But there are some things you can do with Facebook that a lot of people don’t know about. Today I’ll show you 3 of them. 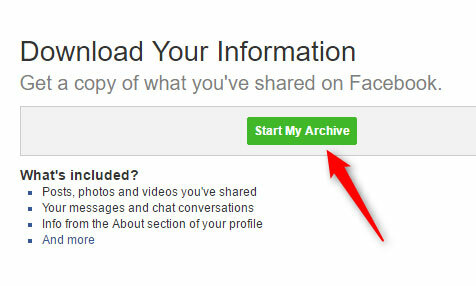 Click “Start my Archive”. You’ll have to enter your Facebook password again, then Facebook will start organizing your entire archive of content and they’ll send you an email when it’s ready for you. Mine took about 10 minutes. When it’s ready, click the link in the email to download, enter your password again, and you can download everything in a .zip folder. Open it up and there’s all your stuff! If you have had a Facebook friend who has passed away, you might have wondered this yourself. Wouldn’t it be ideal to have some kind of final post on your Facebook status to let all your friends know when you have died? I mean, obviously some of your real-life friends and family would already know, but a lot of them would have no idea. In anticipation of this, you can designate someone to be what Facebook calls your “Legacy Contact”. You just choose someone who will be able to log in to your account and write a pinned post (meaning that post stays at the top) to let everyone know you are no longer around. 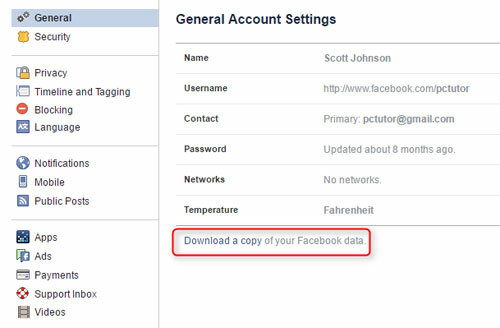 To do this, log in to Facebook and go to Settings -> Security -> Legacy Contact. Find the Legacy Contact “Edit” option and you can enter one of your friends to have this job. Of course, it needs to be someone you trust. You’ve probably seen some of those cool pictures or videos that a friend has uploaded to Facebook. As you move your phone around, you can see a full 360 degree view – just like you’re standing where the person was when they took the picture. This doesn’t require any expensive equipment. You just need your smartphone and the Google Street View app (free for Android and iOS). Basically you just run that app and open the Camera option within the app. Then you take a picture, move to the right a little and the app takes a picture on its own when it’s lined up properly with the previous one. You just keep doing that, save the file, and then upload the picture to Facebook. Nothing to do with your tip this week, just to offer congratulations to your daughter on her wedding – she looked lovely, and you looked very debonair yourself.